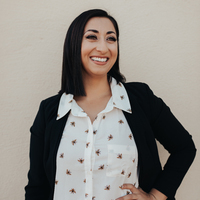 Central Coast of California-based interior designer, Ariana Afshar Lovato, has always had a spark for design and all things creative. Ariana founded Honeycomb Home Design in 2016 and offers full service Interior Design to her clients. Central Coast of California-based interior designer, Ariana Afshar Lovato, has always had a spark for design and all things creative. With an Associate’s Degree in Interior Design from Fashion Institute of Design and Merchandising (F.I.D.M.) as well as a Bachelor’s Degree in Business Administration from the University of LaVerne, Ariana possesses a strong understanding of design and culture to create spaces based on her clients’ passions and inspirations. Upon graduation, she began her career with an internship for a successful local Interior Designer, where she went on to earn a spot as an Assistant Designer, managing large scale projects on her own. She then went on to gain more than five years of experience working for a Design/Build Firm, in Product Design and Development, and even online Interior Design before deciding to go out on her own. In 2016, Ariana founded Honeycomb Home Design, an Interior Design studio in Arroyo Grande, California. Honeycomb Home Design has a simple mission: creating timeless interiors with a modern edge. Ariana’s clientele ranges from Physicians and Lawyers to busy families on the go. Honeycomb Home Design strives to be extremely organized and structured to ensure your design process goes as smoothly as possible. Ariana understands time is money, and it’s her goal to make the best use of your time and money!